This is a quick unboxing and overview of an astonishing Hakase Jade Celluloid fountain pen. Made by Yamamoto San of Hakase. 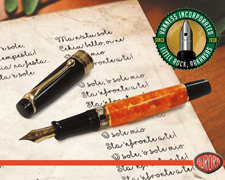 This pen has water buffalo inserts in the cap and barrel ends as well as a Pilot #10 nib in super extra fine. Current wait time for a Hakase pen is over 12 months. While I will do a full review I thought it would be fun to test a different format.